Which is how it happened that I spied a photo on the Instagram account of Elisabeth Prueitt of Tartine Bakery — someone I’ve long admired for both her baking talent and her refreshingly honest talk about being a working parent — last weekend that may not have normally been the kind of thing that got me running to the kitchen (a gluten-free cake, candied citrus rings, plus didn’t I just recently make a citrus-infused ricotta cake?) but why think too hard about it? And, lo, I’m so glad we didn’t. The recipe hails from the wonderful River Cafe Cookbook series, specifically the Classic Italian volume, and in its original format uses a mix of polenta and almond flour, whipped egg whites, butter, ricotta and lemon to make a thick cake that’s nothing like the dry cornmeal cakes you might have had in the past. In fact, it’s so tender and rich, you might almost mistake it for a ricotta cheesecake (Prueitt attributes this to the lower baking temperature). 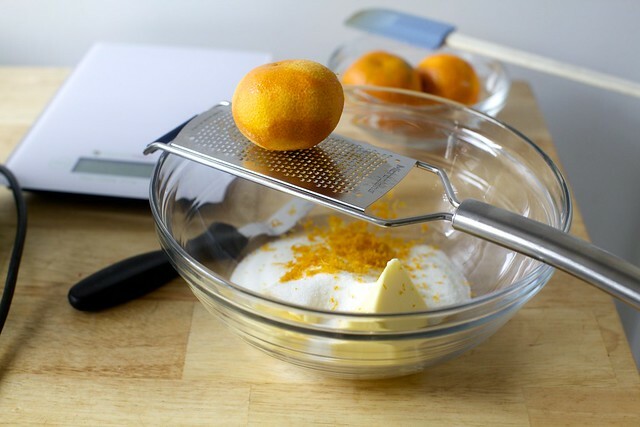 But what really caught my eye was Prueitt innovations; she uses a half-volume of the original for a thinner, delicate cake that she caramelizes orange slices into the reversed cake. The first time we made it with tangerine zest and juice instead of lemon, and sliced almonds as a topping. The second time, I had nabbed some blood oranges and made it with the zest, juice and candied rings, and nothing but almond flour. Both were probably the best-received dessert I’ve made that didn’t involve chocolate, peanut butter or salted caramel and so pretty, they might be the literal opposite of this gray frigid morning of snow flurries. The River Cafe original calls for both the cornmeal and almond flour listed here. I’ve made it this way and I’ve also made it with all almond flour (i.e. an extra 1/3 cup), and both were wonderful; the latter makes it Passover-friendly. I haven’t made it with all cornmeal (for nut allergies), but suspect it wouldn’t be disastrous. If bittersweet lightly candied orange slices are not your thing, and they are not many people’s thing, you can either skip the whole brown sugar puddle upside-down thing (this was Prueitt’s innovation, not in the original; I find her method of making an upside-down cake with no caramel step utterly brilliant) or do as we did in our first round, just cover the sugar with toasted thin almond slices. If you are going to use orange slices, make sure you slice them paper-thin with your sharpest knife. We used blood oranges, other oranges will work too; the original recipe calls for lemon zest and juice. If using measuring cups, be sure to pack your almond flour. The difference between scooped and leveled almond flour and packed almond flour is significant. A few other rearrangements: always zest before juicing, to avoid bad moods. Zest should always go straight into sugar, for maximum flavor release against the grit. Always whip egg whites before egg yolks, so you don’t have to wash your beaters in the middle of prep. I love Italian cookies and cakes. I like how simple in flavor they are and how they aren’t giant sugar mounds. This looks like it would be so nice to have with a cup of tea. WOW! this recipe looks and sounds incredible. We’ve been learning so much about ricotta at Spoiled To Perfection lately. It’s such a versatile cheese. We’ve been obsessed with making lemon ricotta pancakes lately. Beautiful! Cannot wait to make this! this looks perfect. how do you feel about maybe adding some almond extract to the recipe? I have blood oranges from shooting some beer photos (A brewery client of mine makes Bourbon Blood Orange Wheat Ale), and this would be perfect to use up my supplies. Can I sub yogurt for ricotta? I don’t have any. Thanks. This looks amazing! Any idea whether the cornmeal might be able to be replaced with more almond meal/flour? Perhaps if you toast it first? If almond flour is a no-go due to nut issues, is there any reasonable substitute? Re, using all almond flour or no almond flour, from the headnotes: The River Cafe original calls for both the cornmeal and almond flour listed here. I’ve made it this way and I’ve also made it with all almond flour (i.e. an extra 1/3 cup), and both were wonderful; the latter makes it Passover-friendly. I haven’t made it with all cornmeal (for nut allergies), but suspect it wouldn’t be disastrous. Almond extract — Would be delicious here. Campari — Ditto, also yes please. Yogurt for ricotta — I have only made it with ricotta but suspect it should be okay. Katherine — Thanks, about to fix. I made this with half corn meal and half AP flour- was wonderful. I added vanilla. If only I had cute little hands to help me out in the kitchen, I would bake a lot more! Not only did you dive, but you did it twice? Once with almonds, once with blood oranges? Your ‘dig in immediately’ talents are as envy’d as your cooking baking talents. Just the ingredient shopping alone is my speed bump. But I am going to change that … tweak, and dive better. I like that idea. Whoops, guess I should have read the head note. :) Thanks! I love your comment re: making things as you see them. Not only is it something I’m trying to work on myself, but I did it TWICE this week with your own recipes! Delicious green pancakes on Monday and the mushroom Marsala bake on Tuesday (which may be the best thing I’ve made in months). Thank you for both posting delicious recipes and also including reasonable substitutions – not having to go to a jam-packed grocery on the way home from work really helps with this resolution! “Always whip egg whites before egg yolks, so you don’t have to wash your beaters in the middle of prep.” This is great advice, and I don’t know why I’ve never seen/heard it anywhere before. Thank you. I have cara cara oranges and sour cream and all purpose flour. Could that be a thing? Thank you for the interview link. It’s funny, isn’t it, that your adorable photo of your children was taken because you’re the one in charge of getting everyone out the door, with lunches packed, and off to school on time? Not that I can complain too loudly: I slept soundly last night while Rich was up for 2.5 hours with Bea. Sniffly, crawling baby apparently caused quite the ruckus last night. That being said, doing vaccinations on my lunch hour would probably be less traumatic if the second parent was there. Sounds like a wonderful mixture of flavors, so delicious! Do you think you could freeze this cake? I have frozen this cake- just wrap in syran tightly and defrost. It isn’t quite as wet as it was before freezing but still good. I have also punched these into little mini cakes and topped with whipped cream for small passed desserts. Hi Deb writing from Germany. Is almond flour a special flour or are these every finely grounded almonds? I did this last weekend with thekitchn’s sticky caramel babka. I saw the recipe on Friday and by Saturday evening we were tucking into warm, gooey, sweet bread. It was very fun and liberating! This looks wonderful! I love tropical-ish flavors when the weather is like this; pre-New Year, I’m into autumnal flavors and warm spices, but somehow – no matter how cold or grey the weather – I crave coconut and citrus in January and February. It’s a cheaper surrogate for a vacation, I guess! Hi Deb, I think you left out the amount of blood orange juice in the recipe. Maybe I’m just missing it but I thought I would comment just in case. I want to make this cake over the weekend, it’s the perfect thing to indulge in during this freezing weather! mmm saturday morning breakfast? don’t mind if i do. 1. You made a cabbage casserole and put, nay HEAPED, it on coarse mustard-slathered bread and you didn’t tell me about it?! I thought we were friends! In a “we’ve never met but I obsessively read your website” kind of way, of course. 2. I’m loving all the fat little Jacob hands in your photos these days. Must be so great to have a sous chef! Definitely loving the combination of flavours in this simple cake! I think a combination of almond flour and cornmeal sounds great together. So delicious! Thanks lady. I know I can google substitution questions like that, but I can’t trust random internet things when we have YOU! Thanks for all that you do. Hi Deb, can’t wait to make this! When you get a chance, can you provide the info to make with lemons as well? (Amount of lemon zest and juice needed). Also, the amount of orange juice and zest since different oranges- madarin vs. navel vs. blood orange-are such different sizes. I didn’t see measurements listed for the orange zest or juice in the recipe. Oh wow this looks absolutely amazing! Craving now! Oh my lanta, what a beauty. I’ve got a dinner party in a couple weeks and now I know what I’ll be making for dessert. It’s doubtful I’ll be able to find blood oranges in my neck of the woods this time of year. Would regular oranges suffice? Maybe clementines? I promise I’ll search high and low for the blood oranges, but would like to have a good backup plan. Ignore me! Just started reading the instructions and of course you address this. Mea culpa! Pretty cake! I can’t help but wonder though, do you ever worry about putting pictures of your children online every week? I realize most parents share on social media, but most do not have a high-traffic blog. I’m sure you’ve put a lot of thought into how much you share but I was just curious about what your philosophy was. This looks so so amazing!!! Love to see the little hands helping!! You’re raising a brilliant chef ;) Also you made me fall in love with blood oranges with your loaf recipe. And now I can’t wait to make this!!! I’ve been looking for a dessert to make for a dinner I’m going to, and this one is it. I can’t wait to eat it. I have had so many bad moods due to juicing before zesting. It’s nice for the recipe writer to do that thinking for me! Ditto the whites-then-yolks beater situation. I’ve never heard of packing almond flour to measure (although I do with brown sugar). Is that the default? Question regarding the almond flour or meal: I do not have this at home and aside from this recipe, I expect I will have no future use for it. Is there a more common substitute? Everything else I have waiting for me at home, and this looks beautiful and delicious… Would love to make this my first “just do it!” dessert of the year, but the almond flour/meal might be my hangup… Really hoping there’s a substitute! What a beauty, I love that sunny topping! wow This looks Amazing ! ALSO: I love your tips. Whip your egg whites before the yolks? OF COURSE but have I ever thought of that? Nope. Ditto what Emily (@#26) said. Please, please share the cabbage casserole. And this cake? It will be dessert at our dinner party this weekend. CAN’T WAIT! This is stunningly beautiful, and sounds delicious! And I just happen to have a blood orange at home. I ate the other one yesterday and it was so perfectly sweet-tart with berry undertones that it reminded me, in the best possible way, of my childhood favorite–sour patch kids. I know you mention that you got 1/3 cup of juice from your 1.5 blood oranges, but would you say that’s the ideal amount? As another person mentioned, it would be good to know a quantity of juice since different citrus vary so much in size. Do you think this will work in a 6″ pan if I scale the recipe down by 1/2? To Cat above who commented about not needing almond meal flour in the future… the best brownies are almond meal base, so you could use it up, plus the bags its sold in are quite small. Can I use labneh or Mediterranean yogurt (similar to Greek yogurt, but slightly thicker and silkier)? Wondering if I can substitute cottage cheese for the ricotta? I’ve got a tub sitting in the fridge and this seems perfect! It works pretty well as a replacement in lasagnas but I’m no expert. Are we really baking this at 300? Just making sure, I have one in the oven now and after 35 minutes it looks pretty wet still. Same with me. Mine is pale and not at all done at 45 minutes at 300. Where does the granulated sugar go? I’m assuming with the butter and such, but I can’t find any mention of it in the recipe… Talks about it with the zest, then isn’t mentioned again. It’s not super clear, but she does say to add the butter to “the large mixing bowl” that contains the sugar and then you cream them together. I just made this and even warm, it is delicious. I had to bake it a little longer than stated, but it is wonderful and I bet even better tomorrow. I was looking for something to do with a couple Meyer lemons someone gave me off their tree…now to overcome my issues with meringues. I need to hear more about that cabbage casserole. I love pineapple upside down cake, but this takes citrus cake to a whole new level. It almost looks like it would beat home at either a barbecue or a fancy event. Deb – I am so RELIEVED to see grams in this gorgeous looking recipe. You see, I have been making lots and lots of your recipes with applauds from the public (last one was the Feta tapenade tarte de soleil which is again on my list for this week-end), and I have get used to copy your recipes, make the necessary weight/volume etc. conversions in order to facilitate the actual process of cooking… I live in Europe. You do give these conversions at the top of your page, but it is not very practical nor rapid to use. (I remember having seen on some cuisine blogs that just by clicking a button, you can make conversions.) Anyways, I just adore your blog, and enjoy your joyful and spontaneous (looking) writing. Carry on! I love the idea of seeing a recipe and making it… I think I’m going to add that to my “do more of” list for this year. Thought you might want to know that the owner of Tartine spells her last name Prueitt. I need the cabbage casserole recipe! Please please please!!! to # 21: found almond flour!! I third Jeff and Steph… I need to know more about the cabbage recipe! I am nuts for cabbage, even just the plain ‘ol green (white). This cake is gorgeous. I will choose citrus/fruit over chocolate any day. (I know, I’m a freak). Next time I need a dessert, this will be made. Blood oranges abound here in South Florida and I’ve been looking for a way to highlight their beauty. Thanks for sharing this one! You eat the rind of the oranges? I guess the candying process makes them palatable? And they’re not chewy in a bad way? I can’t find the cabbage casserole you mentioned – please share. Deb can we please have the cabbage casserole recipe? Please? Pretty please? Currently travelling but will get started on the green pancakes the second I’m home. This looks delish! I don’t have regular cake pans but I do have a springform. Do you think this could be made in a springform or will the sugar slurry likely leak out? Almond flour — Is the same as almond meal or finely ground almonds. You could grind an equal weights of almonds to make your own almond flour. LF — Yes, you can halve this in a 6-inch pan. Marja — My goal is to add metrics/weights to every recipe but with 1000 in the archives (and an employee roster of one: me! ), it’s slow-going. Whenever you are on a recipe that you’d like to see weights in that you do not, do me a favor and leave a comment asking and I will get to it next, usually within a day. Hope that helps. 300 degrees and baking time — Yes to 300; it’s intentionally low to make it more tender. I think I might need to get new oven thermometer — mine definitely only took 35 to set. That said, always better to check too soon than too late. Don’t take it out until a toothpick comes out clean. Lamia/cottage cheese — I’d expect it to work. Brittany — Some springforms always leak, but I’ve made cakes like this (but not this one) in a springform without problems. If you’re nervous, it never hurts to wrap the outside tightly in foil so even if it leaks, it doesn’t go far. This cake sounds so amazing! Love how the top turns out, so beautiful! My latest favorite links up on the blog today! Made this last night and my gluten-free friend was literally dancing and “mmmm”-ing from the first to last bite. This was absolutely delicious — thanks for inspiring me to see a recipe and make it that same day! With that, I discovered it’s really hard to screw up this recipe! I forgot about adding the sugar until AFTER i added the cornmeal and almond flour. I was afraid it would turn out gritty from sugar that hadn’t dissolved enough, but it was no problem! I was then worried that my batter was much more liquid-y than described — no dollops were necessary, the batter poured right in! I ended up cooking for closer to 50 minutes (including the +5 minutes you suggested Deb! ), but it was absolutely divine. And as for some readers asking about eating the rind, the brown sugar does a great job of caramelizing — all of my guests ate it, no problem! Cabbage recipe: What those guys said. Please. Just spent yesterday evening and the entire morning trying a duck borsch recipe, and there is more than half a Greenmarket cabbage left sneering at me in the fridge. It’s always this way. And I love cabbage. What is cornmeal – we don’t have it in the UK? I’d love to make it. I admire working parents who do such a delicious things. I want to be one of them. This cake looks amazing! I’m definitely going to try this the next time we have ricotta in our fridge that needs to be used up! Are you sure about the oven temp? My cake was no where near cooked after 40 minute at 300 degrees. I cranked the temp up to 350 and cooked for additional 15 minutes. Citrus and Winter. A match made in heaven! This beauty came together easily. I was a bit concerned about the pink hue of the batter from the Moro oranges, but it baked up perfectly. The 3 juiced orange halves equaled your 1/3c measure. I think this would also be lovely in a Meyer Lemon version with a bit of finely chopped rosemary in the batter. Looking forward to trying this orange goodness with a cup of tea later this evening. Thanks, Deb!! Hi! I just made this and it tastes incredible, but just wanted to say that mine took a total of an hour and 15 min in the oven. Just for those who may be stressed that their cakes still look wet after 35 min. Hold out hope! Maybe my oven is wonky. I just popped this beautiful cake in the oven. I did notice an error in the instructions I thought I’d point out. In the instructions, it never says to add the white sugar and zest. I assume this is with the butter, but I didn’t notice until right before folding in the egg whites, so I added it in then. Nevermind! Clearly I didn’t read the instructions carefully enough :). Disregard my previous post! Made this recipe when you first posted it and it was absolutely delicious! Hoping to make it again for Passover this week, but we have a really big group. Has anyone ever doubled the recipe and made it in a bigger rectangular pan instead? Just made this tonight and it’s delicious, but there are a few things I wasn’t expecting. First I should have realized this, but if you’re thinking about it DON’T use a springform pan!! Trust me, you don’t want the bottom of your oven to be the only one enjoying that amazing caramel! Also, I followed the baking instructions, but it was just not baking at 300, so after about 50 minutes I increased the temp to 325, but it still baked for a total of an hour and 10 minutes. It still came out very tasty though-perfect to accompany an afternoon coffee or tea! Deb, you are a genius. Cake turned out great, although a little underdone in the cake, and slightly overdone on the bottom/top-part with the oranges. I will definitely make this again and adjust my oven a little. Thank you for this very forgiving recipe! I screwed up so much (and not because I misunderstood the recipe) and still it turned out fabulously. I separated the eggs and whipped the whites then had to leave all of it languishing on the counter for an hour, so that the yolks had a skin and the whites had fallen and turned liquid on the bottom, so I re-whipped them and hoped for the best. I had to do a Cara Cara Orange slice in the center for two-tone prettiness, and that’s good because my blood oranges were smaller, and I didn’t get 1/3 C of juice from them, so used some Cara Cara juice as well. I also didn’t get a brown sugar slurry that would spread at all on my non-stick parchment, so I added a bit more water, and then a bit more brown sugar…in the end I probably added an extra 1/4 of brown sugar slurry and the juice from the orange slices made it all a bit wet, and I was worried it would throw off the balance of the cake…but it was absolutely delicious, and beautiful. And I used my only 9″ pan, a springform. It worked perfectly, no leaking. Thanks for this! It’s very grey and very wet and we were in need of some mid-winter citrus sunshine! I took mine out after 45 minutes and it was still very wet. It split into a couple of pieces when I turned it out. Not that my belly cares. I just tried this cake, and like one commented it’s just not baking at 300 degrees. At 40 minutes it was still very liquidy. I had to crank the oven temperature up. This is so crazy. I bought Meyer lemons at Costco today. Googled a cake recipe and came across an upside down cake using cornmeal. It is in the oven right now. 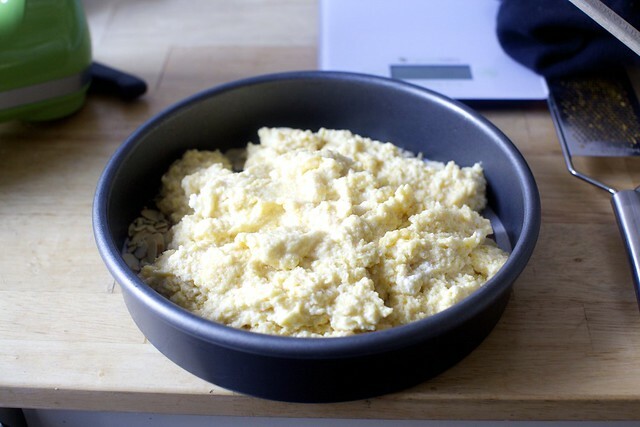 I thought, while it’s baking, why not check out Smitten Kitchen’s latest post. Wow. What a similar recipe to what I just made, only using blood oranges. I am commenting because the recipe I made calls for baking at 350 for 50-55 minutes. I miss the links to what you made 1 2, 3…:years ago. I have a fun goal to make everything you post…and if I don’t like something you posted (like I don’t really like oranges in my cakes, so this one doesn’t appeal to me), then I make something you made on that day in a different year. Looks lush! I adore blood oranges. I am renowned for absolutely having to bake something that I like the look of – immediately! Just made this and it’s tasty, but the almond meal is still very distinct and mealy. Is that normal or did I mess up? I packed the cup when I measured it, but it certainly seemed like a lot. Also had to make it in a pie dish because I think wifey lost the cake pans in the move. It is very helpful to read notes from those who have made the recipe. The photos are gorgeous, but the real life notes help the most. – It is probably not optimal to use a springform pan like I did. The brown sugar ended up caramelizing a wee little bit of the bottom of the oven. Not terrible but not desirable. Then again, removing this from a conventional cake pan may be difficult where the springform was easy. – It is not super simple to slice blood oranges paper thin, so I cut them a little thicker but removed the rind as I went. That sacrificed the whole orange look, but the rinds on these oranges were THICK and would probably not be very good so this was a reasonable compromise. – This cake needs to bake longer or at higher heat. I did 325 for 40 mins, and that was good. – Overall this was very tasty. I’d say my version was not as pretty as the pictures, but the apricot jam on top helped glam it up a bit. I’d make it again based on the good flavors and textures. I did use blood oranges which I love. You suggested to Brittany that a springform be wrapped in foil in case it leaks. I usually put a baking sheet with edges under a springform so that it can leak on to the sheet. Do you think that having the sheet in place impacts the baking in anyway? I made this yesterday and it was so delicious and gorgeous. I’m so excited you’re using blood oranges so much lately! I’m going to make your blood orange and fennel salad today! My notes: I cut my oranges on a mandolin and that made it super easy to get the thin slices. My oven runs a little hot no matter what I do, so the temperature hovered around 320 the whole time and my cake cooked in about 45 minutes. I used a conventional cake pan (with the sheet of parchment as called out) and had no problem at all turning it out. Deb, can I just say I am quite inspired by the “find a recipe you love and make it immediately” approach to cooking? I’m on it. And with those little people in your house, I wonder if you have discovered the children’s picture book “Mother Bruce”? It’s about a grumpy bear who loves to prepare eggs using recipes he finds on the Internet. But he looses his appetite when his eggs hatch into baby geese one morning… and the geese believe he is their mother. It’s hilarious and particularly delightful for those of us who are more than a little food-obsessed. I’m a school librarian, and every class I read it to last week was captivated. The cake was a real hit, especially with my gluten-free boyfriend. I took the almond option as that was what the crowd wanted and used Meyer lemons from a nearby tree. I also need to bake it closer to an hour, but it was moist, light, and delicious. Definitely a keeper! I made this yesterday and it was delicious. I had neither almond meal or cornmeal, so I made it entirely with chestnut flour. It was wonderful and moist. I did half the recipe and use my 6″ springform. Some of the caramel leaked out, so I’ll have to try wrapping the bottom next time. Instead of using 1.5 eggs, I used one. I also cut the sugar down to 1/4 cup in the cake. The recipe is very forgiving and delicious. Oh, and I had no trouble with baking time. Using my convection oven it cooked up in around 35 minutes. Thanks for sharing, Deb! I seized your advice and made this cake as soon as possible! I ended up having a little custard-like layer on top of the some of the oranges when I inverted– would you imagine this is due to unevenly cut oranges/batter just getting underneath the oranges when I dolloped it in? It was delicious, just far uglier than yours above! This was unfortunately a flop for me. Flavor wise it was excellent based on the custard like consistency I ate. But after baking for an hour and what looked like a set cake, it just broke into a custardy mess when flipped! Deb, any advice ? The cake tester did come out clean and the top was nice and browned. Maybe I should go till 90 mins like some of the other commenters? Oh Deb… I bought some good looking ricotta cheese at Fairway (out in NJ) and decided early last week that I would like to make some kind of ricotta cake. And low and behold, the next day, what should show up in my email but your blog post!! So I made it today. But with Meyer lemons as there were no blood oranges to be found at the local yocal market near my home. Oh. My. Goodness. This cake is perfect. Just perfect. I think I wanted to eat the whole thing. Luckily there were other people around so I wasn’t able to. The meyer lemons were very very good, and worth noting how nicely it went with the cake. Not as dramatic as the blood oranges visually, but still beautiful. I did not have any light colored jam or jelly, so I used my orange blossom honey to glaze the top. If I find the blood oranges, I will try it next, but I wouldn’t hesitate for a moment to use the meyers. Did I say it was PERFECT?!! Oh, I should mention I did probably cook it about an hour at least, in a 9″ aluminum cake pan. The center felt done and at that point the edges had just begun to pull away from the sides of the pan. Your recipes are usually foolproof but this one needs more testing in the kitchen and a reformulation. The result tasted too strongly of cornmeal, like orange cornbread. You warned about the moistness of the cake but I found the consistency mushy even thought I tested it and left the cake to bake for what amounted to 60 minutes. Neither the attempt at caramel nor the blood oranges added anything special to the cake. Sorry to say this recipe’s a fail. I made it with hazelnut flour rather than almond flour (because I particularly like orange and hazelnut together) and it was quite yummy. It was also handy, because I had exactly 165 grams of ricotta I needed to use up. I can’t wait to make this for my book group this week. I’m also serving your chicken meatballs, so thank you Deb for making my hosting duties easier. This is absolutely stunning! I made an orange vanilla upside down cake for my blog and it just whet my appetite for more of the same. Can’t wait to try your recipe! I love the idea of creamy ricotta in the batter. PS – I made your sour dough, kale and caramelized onion stuffing for Thanksgiving. Loved it! Made this on Saturday and it was delicious! Any tips for getting the orange slices paper thin and whole? My paper thin ones were all missing edges. The whole ones were closer to an 1/8 inch or more. I made this the other night, here are my thoughts. 1. Do NOT use a spring form, even with a drip pan underneath. 2. Are you using a magic oven? The baking time is WAY off. I have a spot on oven and this took over an hour to bake. 3. Flavor is good, texture is odd, a bit granular. I loved it as did my picky kids, not so much the hubby. Not too sweet, just right. I second Pam’s note that the instructions for the sugar are easy to misread, though it didn’t seem to do any damage to toss the sugar in at the end! I popped my cake in the oven and then thought “Huh, I guess the sugar goes on the top of the cake at the end, somehow?” Then I read the comments and realized the magnitude of my error. I mixed the sugar in, but I probably should have just scrapped the cake; there is no way it will come out the way it’s supposed to. If I were a more serious baker, I’m sure I would have figured out the problem sooner, but I spent all morning baking, and now I am very sad. Please update the recipe for clarity. Magnificent! Light and full of flavor. I used all Trader Joe’s “Just Almond Meal” (no cornmeal), which seems to be coarser than almond flour and made for a darker final cake. Fwiw, I needed about hour and ten minutes at 300 degrees. I made two because I wanted to try one with the brown sugar/water mixed and one with regular sugar that I heated and made into caramel. Like a handful of others, I found that baking at 300 for 45 minutes wasn’t adequate. The batter remained like a liquid. So I baked it a bit longer. Just out of the oven and I’m hopeful that the two will be tasty. Another vote for the cabbage casserole please. I love cabbage. I figured out how to search your archives via year and month, so ignore my past comment about linking to what you made 1, 2, 3, etc. years ago! I linked back to January 2015 and found I had made almost all of the recipes – haha, figures, I’m addicted to SK. You are such a good writer and recipe collector and recipe adapter! You are great at what you do! Thank you! Took your advice and made this the same day I saw the recipe! Used dark brown sugar instead of light since that’s what I had, and 1) it wouldn’t spread, and 2) it came out very gloopy and you can’t see the orange slices, sad. Still delicious though! Chiming in to agree with other commenters on bake time. I settled on 40 minutes at 300 deg. and wish I would’ve left it in longer. (FWIW, my oven tends to run a little hot.) The cake was definitely cooked through, but was loose and kind of strudel-y (not necessarily a bad thing! ), which meant that I couldn’t cut it with nice clean edges like in the photos. Is it possible that some of the differences in experiences here might be coming from amounts of juice in oranges used? I used a coarse grind cornmeal and can see how some might feel that lends to a cornbread-like taste, but I enjoyed it. This was even better on the second day when the rinds started to candy more! Swooooon. What a stunning cake m’dear! Pinning and sharing! Made the cake yesterday-with excellent results-but as always was wondering about a tweak-I needed extra baking time-wondering if 325 F would be better. I even made homemade ricotta- as I had extra milk. This is really a nice winter treat!! OK after reading all the comments-will always bake @ 300 F for tenderness-but will give it the time it needs to bake-and the parchment paper is genius. This post reminds me that I keep coming back to your blog not actually because of the recipes (delicious, nearly fool-proof) and photos (gorgeous, adorable) but because of the oddly hard-to-find sense of: Oh, yes. Exactly. And yes, that, too. I love the idea of a return to whims in the kitchen, a counter to the hamster wheel of adulthood. Impulse recipes, yes, yes! (And thank you much for the link to Elisabeth Prueitt’s interview. Ditto.) I suspect I am not alone in this thought. People seemed to enjoy the lightness of this cake. I thought it was nice with tea, but not my personal favorite dessert. Reporting back about cottage cheese–Taste-wise and texture-wise it works, but aesthetically it’s a little weird. You can see the little square chunks of cheese in the cake. If subbing cottage cheese, I’d recommend processing it first to get a smoother consistency. 1. If subbing cottage cheese, process for a smooth texture first. 2. For the parchment paper circle, err on the side of too-small rather than too big. Butter/spray the pan generously and it will come out fine. 4. Blood oranges really seem like the way to go for presentation. Use a SHARP knife and make slices off the whole fruit. 5. Increase temp to 325, start checking around 45-50 minutes with a toothpick. 6. Turn out promptly after the five minutes of cooling. Lots of your recipes call for the zest of oranges/lemons. 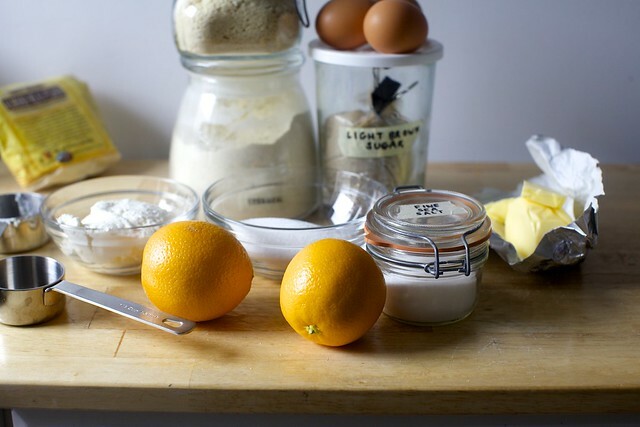 Do you always use organic oranges and lemons? Wonderful! We did not have almond flour so I used 1 cup of Pamela’s Pancake and Baking Mix instead and it was great. I think you could double the blood oranges on top and decrease the sugar content in the batter as well – something to try next time. This will become a new treat staple in our house! Made this as the “adult” cake for my son’s 2nd birthday party, and it was exceptional! Also loved that it was so easy, and perfectly “make ahead,” which of course helps with the stress of hosting in a tiny apartment in Brooklyn. Exactly the sort of taste that I love and find so satisfying. No child liked it, but I would be lying if I said I was sad about that. A delicious and really pretty cake. I baked mine for about 45 minutes and made the cake as written. I wouldn’t change a thing. I’m going to do an almond-crusted version next, though I might miss the bitterness of the orange rind. Looks great! Planning to make it for a dinner party but I’m wondering why I see sliced almonds in the pic with the cake pan? And what size cornmeal do you recommend? corn flour or medium grind? Thanks! -Used halved plums defrosted from the freezer for the topping; was worried these would be too wet but turned out great! Made this last night and it got second-helping approval from my Mediterranean in-laws. Not too sweet and very flavorful, excellent with coffee or tea. I wanted to make this to use up some ricotta that was about to go bad, but in medias res (does this ever happen to anyone else? ), as the egg whites were whipping, I opened the container to find a sour mess. Scrambled to find a substitute and used Greek yogurt, which was fine, though I might reduce the volume if using it again, as the batter was a bit soupy going in to the oven, and it definitely extended the cooking time. I’ll also add almond extract next time to amp up that flavor. For those who can’t find almond meal/flour, I finely ground almonds in my food processor (realllly let them have it in the machine, almost to the point of getting butter), and it worked great. Didn’t have jam for a glaze but the brown sugar made the top plenty sweet; next time I may brush some Cointreau or Grand Marnier on at the end. 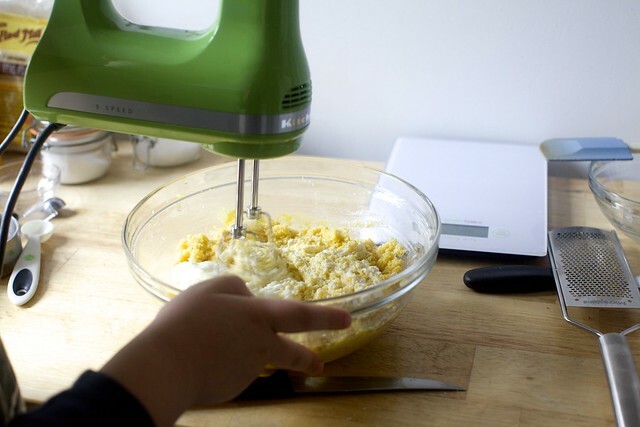 This is a rare recipe where I think you’re better off with a hand mixer; I only have a stand, and it meant using more bowls and a bit more juggling (switching whisk attachment to paddle, etc.) But this will definitely go in my make-again folder! It took me a good 20+ minutes to spread the brown sugar and water evenly using dampened knuckles and fingertips (and cursing softly). That alone could be a deal breaker but I haven’t tasted it yet. Slicing the blood oranges with a good serrated bread knife did the best job sans mandoline. Fresh ricotta is the key to this recipe. Sour cream, yogurt, or cottage cheese ain’t it. 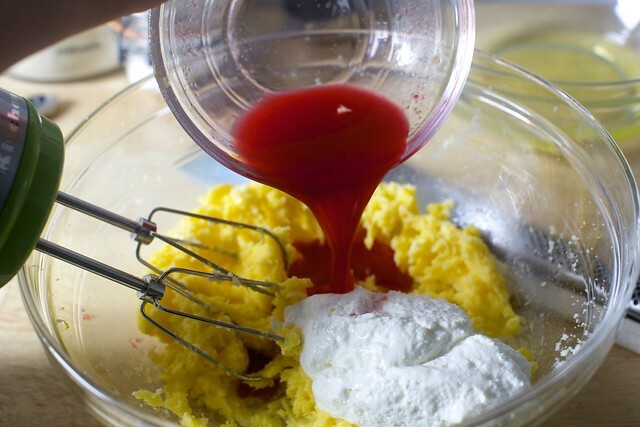 In the original recipe, the salt is put into the beating egg whites. A similar recipe on Epicurious bakes at 325 for 40-50 minutes. Another one, which uses a skillet rather than a cake pan, bakes at 350 for 45 minutes. Admittedly the original says 300 but considering many previous comments, I can’t help wondering if that was a typo. This cake, viewed from above, is a cookbook cover girl–even with slightly burned edges. This blog entry is reproduced on another blog, with text and photos but no credit. Deb, call the lawyers. MR — Thanks for the heads-up. If only I could! I almost always ignore these things unless it’s a big site because my time is better allocated elsewhere. But still: annoying. 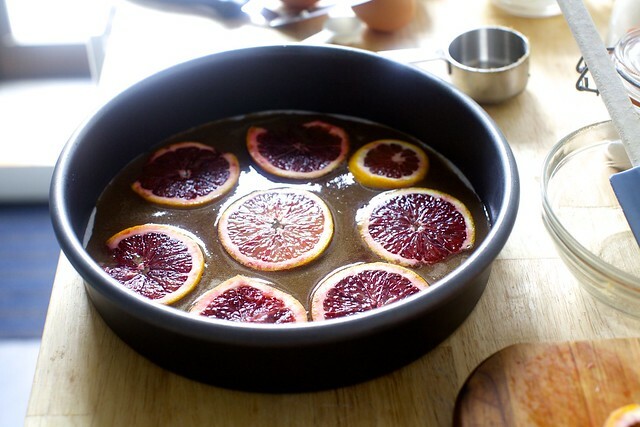 This photo made me want to make the cake and when I saw blood oranges at my Farmer’s market I couldn’t resist! I guess I should have looked at all the photos first, but in the recipe I wasn’t sure that the sugar was to beaten with the butter at first. I just thought the zest was going to flavor the sugar while the other ingredients came together? oops! I realized my mistake and added before I added the egg whites. The dough seemed a little grainy but the end result was beautiful! I did not end up taking it to my book club bc it seemed grainy. Is that the way this cake is? It is not too sweet and I cannot wait to try and make it again. Love your website Deb!! Munich — Sometimes, but I always scrub them a little either way so any waxy/shine is removed. Baking time — I’m sorry to hear it was off for so many for you. It worked for me (twice) and also Prueitt’s. Regardless, it clearly was off for many of you; a note now added. To get orange slices thin — Your sharpest knife! Another option — If you’re nervous about the baked rind making things too bitter for your taste (many don’t like it), you can always use thin slices of the orange or other citrus sans peel; still looks pretty. Re, concerns about the soft texture — I thought I’d made this clear, but I guess not clear enough that this, to me, tastes halfway between a cake and cheesecake, which we loved. (vs. many flour-free nut-meal or cornmeal cakes that can be stiff and or/dry.) I will try to make this more clear. MB — Book sounds hilarious, thanks. A — I don’t think the sheet should impact the baking much but there’s a difference between catching leaks (the sheet pan) and trapping them in (foil) and I prefer the latter. Some might leak into the cracks, but you won’t lose much volume of the cake if your pan is leaky. On a baking sheet, batter could trickle slowly out for longer and waste more. Hope that makes sense. I saw that a few other people commented on this, but thought I would mention that I too ended up adding the sugar at the end because it wasn’t clear that the butter was being added to the bowl the sugar was in. What I like about this recipe is that it’s naturally gluten-free. No need to search for substitutions that may derail the outcome. Can’t wait to try it & thanks for posting! I’m much more cook than baker so not sure if silly question but what size cake pan should i use. B woods — A 9-inch springform. No baking powder/soda is required? Tina — This cake gets its lift from egg whites. This looks so decadent! Thanks for posting! I also wasn’t clear that the sugar bowl was one in the same with the dough bowl (though my fault, I should have looked at the pictures more closely!). I added in at the end. It’s currently in the oven so I hope it all works out. I also needed to use a lot more sugar/water to get the right consistency to be able to pour it into the pan (maybe another 2TB water and another 1/6 of a cup of sugar). I made this with 1/3C almond flour, and 1C cornmeal, and mine turned out to be dense and grainy. I guess one gets the rich, creamy, cheesecake-like texture only with 1C almond flour, and 1/3C cornmeal…But still recipe’s a keeper! Thanks! I made this tonight with all almond and foolishly misread so doubled the flour instead of just adding an extra 1/3 cup. I also couldn’t get the mixture smooth after adding the ricotta and juice. It took quite a bit longer to bake, but it’s still delicious and moist and the texture is fine. This is an extremely forgiving recipe and made for a fun project during the snowpocalypse. While mine wasn’t as pretty as Deb’s (but that would be impossible!) it came out really well! My cooking time was 45 minutes at 300 degrees, but I cooked it in a convection countertop toaster/roasting/baking oven. Was super yum with a side of vanilla ice cream. I also put both orange rinds and almonds in the top part and everyone loved the combo! This was delicious (and so pretty, though mine was not as photogenic as Deb’s!). My husband said it reminded him of besbusa, though this was much less sweet. It cooked in 45 minutes and I served it warm (and the family loved it!). I preferred the cake when it was still warm, but it was well received cold at breakfast this morning. :) and, slicing it cold was much easier and cleaner. I make this and the egg bake during the storm yesterday – thanks for inspiring a winter’s brunch! I probably should have read the instructions first – i didn’t realized until after i turned the cake out of the pan that it was an upside down cake, and i stupidly reserved half my orange slices for top presentation. i also didn’t have almond flour, so i used all cornmeal and added almond extract since i wanted the flavor….yeah. it turned out to be a glorified new cornbread option that would have paired well with chicken chili, i think. I’m going to say that it’s probably worth editing the directions for clarity on the zest and sugar based on the comments from folks that have missed that step – us included. Following the instructions as written led us to folding in the egg white before realizing that the sugar was still in a bowl set aside! We lightly mixed in the sugar and zest as best we could – we’ll just have to see how it turns out! Made it for a dinner party last night and it was fantastic and beautiful! A new go to for sure. Many thanks! I made this with lemons, since lemons were what I had lying around, and didn’t bother correcting the sugar. It came out wonderful! In fact, I brought it to the office and everyone loves it. Thank you, Pam, for clarifying the “when to add the sugar” problem that I was having. I am a very experienced baker, having done it professionally at one point in my life, but I still didn’t feel certain when the sugar should be added to get Deb’s results. The butter, sugar, zest, and egg yolks are in the KitchenAid right now! Never tasted blood orange and the combo really sounds interesting. This looks so beautiful, I am making it tonight as a test (poor me) for a Valentine’s Dinner next month. I do not see where the granulated sugar+zest goes but I assume it’s with the butter in the beginning stage of fluffing it. Thanks as always for your culinary creativity! This worked for me, but only after a couple of tries. – My oranges yielded far more juice than Deb’s – about 1 1/2 cups. The first time, I used it all and the cake was too soggy, so next time I only used 1/3 cup and results were much better. – First time, my cake was too damp, so I put it back in the oven for 10 more mins after I’d inverted it. This made the top deliciously chewy and caramelized. I recommend this extra step. More updates — I’m sorry the sugar addition was so unclear; now fixed. Baking time — I added a note last week that it might take longer (as it sounds like it is for many of you) but wanted to let you all know that I take these things very seriously and went out and bought a new oven thermometer (my two in there are ancient) because of this and it’s still showing my temperature as spot-on. I say this not to sound like I’m saying “I’m right!” because the only thing that matters is that my recipes work for you the way they say they will, I’m starting to think my dinky oven might just be more robust than it seems. I’ll keep this in mind in future recipes. As always, checking too soon is always better than checking too late, but the goal (for me) is accuracy. I suspect that the wide margin in the thickness of the ricotta being used might be the culprit in the varying cooking times/temps. Maybe a suggestion to drain any commercial ricotta over cheesecloth and/or not using part-skim, etc? I forgot to comment when I made this two weeks ago… I was scared off by other posters saying their springform leaked. That was my only 9″ round pan so I did some math to discover that the surface area of a square 8″ Pyrex is nearly identical. Oh, and it was completely delicious! I’m happy to report that I forgot to pack the almond flour…and it didn’t matter anyways, because I didn’t buy enough…and the cake still came out great. I was worried because the batter tasted really sweet to me, but in the end it was fine. a note: I used sheep’s milk “basket” ricotta, which seemed pretty strained since it sits in it’s own basket in the container but, I also had to cook my cake well over the noted cooking time. I think It was about an hour until the top was not a wet, jiggly mess and the cake had pulled away from the sides. Of course, this effected the sugar and oranges and they were both pretty brown. But it all worked. This is a new favorite, and is going into our permanent repertoire! I have several family members with Celiacs, and love having a recipe that the glutinous pastry connoisseurs (me) and the gluten-free can enjoy equally. 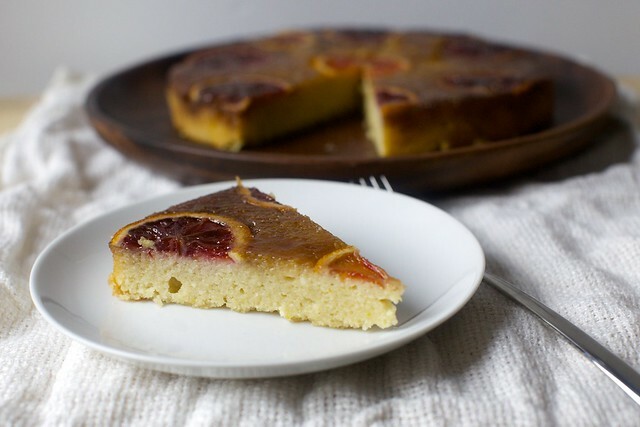 The balance of richness, slight bitterness from the blood orange and corn flour, not-too-sweet cake, and beautiful sweet caramel is just spectacular. It’s a sophisticated and moreish dessert that (hooray!) happens to be gluten free! I made this yesterday for my gluten- and dairy-free spouse, using homemade almond “ricotta cheese” and Earth Balance buttery sticks for the dairy components. I don’t often like the gf/df versions of recipes I’ve adapted so he can eat them, but this worked perfectly. It tastes like it was originally developed with these ingredients. Hooray and thank you! We’ll be having this often! Thank you for posting this! I was just going to ask if anyone had any ideas for dairy free options. :) I’m just recently dairy and gluten free and it’s been tough. I also tried this recipe using Earth Balance and coconut sugar instead of white cane sugar as well as a local sheep’s milk ricotta for a family member who is GF/DF as well as no refined sugars in their diet. crowd who need various substitutions for their diet. And it’s so beautiful! Thank you!! I made this today, but planned poorly and had to make a bunch of substitutions—and it still turned out well! I used 1/2 c white sugar + 3t molasses instead of the 1/2 c brown sugar (so happy to find this in your tips section a few weeks ago), Icelandic strained yogurt instead of ricotta, and corn flour instead of cornmeal. It took about 50-55 mins in my oven. So tasty and such great texture — will definitely make again! Thank you! How much zest? From both oranges? Forget above, I just reread the directions fully, this time! Absolutely delicious, thank u! To brittany’s comment above, sadly all my caramel/brown sugar leaked, ( i did put some parchment paper underneath) leaving a very pale top.i also skipped the cornflour using only almond meal( ground almond in europe,), it took around an hour and still very moist. Hey Deb – I made this, and while the flavor is great, the appearance is dismal. The color of mine is darker (almond meal vs. flour? I used meal), and the unglazed top looks very rough/prune-y. Although putting on the preserve glaze helps the appearance little, I find it to be too sweet. Do you think it would be possible to skip the brown sugar part, and instead make a real glaze for after it comes out of the oven? Or do you think the brown sugar is really needed to caramelize/cook the oranges and hold them in place? Amanda — I think the brown sugar is what makes the orange slices caramelize and without it, it would be too bitter. It also probably helps loosen them from the pan, since the sugar is wet. It can’t hurt to experiment, though. I made it! It was great hot, but we much preferred it cold and on the second day. It gave the cornmeal some time to soften. Made this yesterday, and it is delicious. However, due to the high moisture content, I would recommend storing this in the fridge. Mine already had tiny green mold spores after less than 24 hours on the counter. Could be attributable to the environment in my house (which is scary to think about), but better safe than sorry. Just have to say, what a delicious cake! I tried to persuade my children that they wouldn’t like it because it was soaked in vodka (it wasn’t, of course), but they tried it anyway (damn!) (and also yikes!) and also loved it. To me, this is the perfect pudding-cake. I will be trying variations… Thanks Deb! Deb, I made this last week to take to my gluten-free aunt’s house, and it was glorious. I made it as per your original recipe, with one blood orange and one regular, and with Bob’s Red Mill polenta vs. regular cornmeal because that’s what I had…it was tasty, moist, and something different. Everyone loved it, and I looked like a kitchen wizard. I’ll do it this weekend with an almond top, in order to use the rest of the tub of ricotta. Thank you! Marvelous recipe! 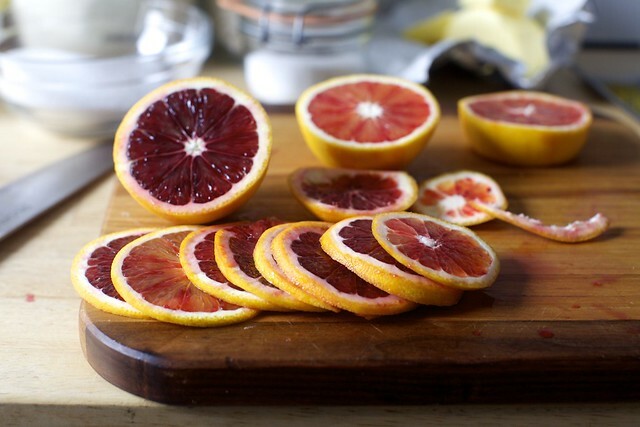 The blood oranges are both delicious and beautiful. I’ll keep following you and trying out your recipes. Thanks! Made my second cake today – yes it is that good, in fact may even be my very favorite recipe from your blog yet! – and a strange thing happened this time. The brown sugar didn’t seal the blood orange slices into place like it did the first time. No pretty upside down cake effect this time. Oh no, instead it seeped under the parchment paper and formed a layer of caramelized sugar between the paper and the pan. I am so very puzzled by this! Consequently the cake fell into several pieces when inverted. Still delicious, don’t get me wrong, but I’m glad this one is for family consumption. Any thoughts on the mechanics of this? Same pan, same size parchment circle, same oven. Guess I need to make a third cake later this week…. ;)! Anna-Minna — Not sure why it was different this time, but a lot of springforms are just prone to leakage and if you’re worried, the safest thing is to tightly wrap the outside, focusing on the base, where it would leak from, with foil so even if a little escapes, it won’t go far and the foil barrier will keep you from losing too much batter. Deb, I have a confession to make. The first time I made this, mere days after this post, was for a little dinner party with friends — I was excited for the impressive/pretty factor. But due to a rookie mistake involving the springform base sliding around on the cooling rack, the whole thing flipped upside-down on the floor instead of on the cake plate. I’m not ashamed to admit that I picked still-hot bits from the top of the floor-cake, and nearly wept from the deliciousness. Then mopped the floor and made a different cake since I was out of ricotta. Last weekend for the Super Bowl, I made Redemption Cake. Even my out-of-round and leaky springform couldn’t bring me down, and you’d better believe that sucker ended up on the plate where it belonged. It tasted like sweet success. Thanks for the fantastic recipe! I want to add my voice to the chorus (sorry Deb) just because the comment section always helps me. This took 1 hour and 15 minutes in the oven, and even then it was a little gooey for my taste when served. (My husband loves that I’m impatient with baking because he abhors dry cake, and commented “perfectly undercooked as always!”) It definitely benefited from a long cooling off period and chilling overnight in the fridge, but i can’t help but wonder if something was off with the recipe. I think I’d make it again (it was delicious!) but would allow a lot more time. I just made this and my oranges are somewhat sunken underneath the sugar mixture, not prettily visible on top like yours. I followed the measurements exactly, but did feel that when I was applying the sugar paste that it was somewhat thick and difficult to spread evenly on the parchment. I laid the slices gently onto the sugar and was very careful not too disturb them when scooping the batter into the pan. I am disappointed with the appearance, but am going to make this again in a few days. Do you have any suggestions for improvements? This was absolutely lovely! I added an extra tablespoon of water to the brown sugar at the beginning because it just seemed too thick. This part did not caramelize, but the cake was still delicious. I baked it for about an hour and topped with butter pecan ice cream. Another winner! I’m also in the “It just wouldn’t cook through” camp and now am slightly obsessed with what might be causing so many people to have problems with this recipe. I wonder if there’s a difference in the amount of water in the ricottas that people are using. My batter was very wet, which makes me suspect that perhaps I should have strained the cheese before adding it. I used a 10% milk fat (MF), 73% humidity ricotta. In Canada, the labelling is different so I had to guess about an equivalent for “whole milk” ricotta. I know see that higher MF versions exist, so I am tempted to try again with that. Could the textures of the cornmeal and almond flour also make a difference? Perhaps a finer grain cornmeal would be more absorbent. This cake was a miss for me, mostly because of the texture. Why one would ever combine almond meal and polenta, I don’t know…the texture was much more like underbaked cornbread, rather than cheesecake, and I don’t think all the baking time in the world could have helped it. The flavor was also just kind of meh. I was still intrigued, however, by the combination of blood oranges and ricotta. So I found a nearly identical recipe that called for all-purpose flour. The result: Magic! This texture was perfectly moist and fluffy. Or link to my site through my profile. I FINALLY got the chance to make this cake (thanks to a visit from grandma who took over baby-wrangling for a few hours — my Amalia is just a little bit older than your Anna!) and it was just as good as I hoped it would be. After reading all the comments about baking time, I suspected that the wetness of the batter would make a big difference. So made sure the egg whites were quite stiff, I used a fairly solid fresh ricotta and avoided the liquid from the cheese when measuring it out, and I only used 1/4 c. juice (which was all that my rather lackluster oranges gave me.) The cake came out perfectly at the time and temperature given. And! Due to dinner time and evening plan shenanigans, I had to leave the cake assembled but unbaked in the fridge overnight, and then bake it off in the morning. It still came out perfectly. I even wonder if that gave the cornmeal extra time to soften, because the texture was still nubbly but smooth and beautiful. What a great cake. what would happen if I replaced the water in the brown sugar slurry w butter? Good things? Gross things? EB — I don’t think they’re going to work the same here, although butter is always delicious with brown sugar. I’ve *only* ever made upside-down cakes with brown sugar and melted butter. Before this post I literally had never heard of/read another way of making an upside-down cake! UPDATE: I made it as written. It was delicious. I saw a question about whether you could freeze this but did not see an answer. I have a work breakfast that I would love to bring this for but I work late. Would freezing it and defrosting or freezing the batter work? Jacqueline — I haven’t answered because I haven’t frozen this cake. But I can’t imagine why it wouldn’t freeze well, to be honest. Hi Deb, missing weights for the brown sugar here! Also, this recipe was amazing with navel oranges too! Thank you!! Good morning! It’s me from 2/12/16. I made this recipe again twice over the weekend. Let’s not mention the first time, lol. The second time, I went into problem-solving mode. I added 1/4 cup of flour along with my almonds as I food-processed them (1 cup final product), limited my orange juice to 1/4 cup as suggested by another commenter, baked for 1 hour 5 minutes at 325, and cooled it for two hours before unmolding. It came out far better than the first two times, and was a big hit. The flour adaptation came about as I wondered if my homemade almond meal just isn’t fine enough to work in this cake. Maybe those using almond flour are having the good results? Hope this helps someone! Deb, thanks for your website! Made this for Passover with all almond flour. It was a huge hit, and the carmelized oranges came out perfectly. Just a couple of notes. The brown sugar/water mixture was more paste-like than slurry-like. Also, it took a full hour to bake. Definitely adding this to the regular and Passover rotation! Thanks for another hit, Deb! I only have an 8-inch spring form pan. What advice can you share for this change? Thank you! Followed your instructions to the letter & had no problems! Used blood oranges and the cake was delicious! Would have liked more orange slices but next time I’m going to try the almonds. Think it would be yummy! I have bought your book and tried many of your online recipes. This one was the only failure. It cooked an extra 15 minutes at 325F, then an extra 10 minutes at 300F as I was afraid it might burn. ( I follow recipes exactly) Then the extra 5 minutes as noted. The oranges were covered with liquidy batter that I scraped off, and it looked very pretty. I had to throw out the blood orange slices as they were tough. The cake itself tested clean but when I flipped it it flopped. I waited 10 minutes then attempted to slice it. I had to use a spoon. I will be deleting this off my favorite board. It looked great as I wanted a recipe with my homemade ricotta. Maybe just cannolis. I read comments although it is pretty hard to find any hard information with all the “This looks so good” comments. I loved all your other recipes, and your book is one of my favorites in my collection of over 40 cookbooks. Here I come with a success story (alternations seem to be the norm). Other than the baking taking the hour that others mentioned (I exaggerate, it was only about 45 min) i followed the recipe. My citrus was clementines, and i used the full 1/3 cp juice and it was delicious. Yes, the clementine slices were somewhat tough, but everyone enjoyed eating them all the same. Laina — Maybe try a lower temperature for a little longer if it seems to be getting too dark on the outside before it’s cooked through. This cake was a winner. I threw in a tablespoon of amaretto and used navel oranges because blood weren’t available. Otherwise, I followed directions as closely as possible. I baked it for probably an hour, checking the consistency several times with toothpicks after 35 minutes. It was lightly brown on top when the toothpick came out clean. I let it cool for 5 minutes, slid a knife around the edges, and flipped it on to the plate without incident. (Phew) I let it sit at room temperature for several hours before bringing it to a dinner party. It was absolutely delicious. Went well with the scotch we were drinking too. We were 4 adults and ate nearly the whole thing. I hadn’t worked much with cornmeal before, so I just used the coarse ground that I had in my fridge. I definitely wish I’d known to use fine, as I really think it would have made a much better texture. Also, I used grapefruit since I couldn’t find blood orange, and I thought the flavor worked well. I was terrified when I put the juice in and the batter looked like a broken mayonnaise, though! I haven’t used it but from Googling just now (I just scanned the first couple results) it doesn’t sound like it would be an issue. Just made this yesterday and got rave reviews from my cookbook club gal pals. I needed 45 minutes at 300 degrees to get a clean toothpick, so it baked for 50 minutes in total. It was still *very* loose/wet when unmolded, and sadly, it did not get onto the cake plate in one piece. But the apricot glaze helped to hide the cracks, and by the time we ate it (8 hours later), it had firmed up enough to get the “cheesecake” sort of texture others mentioned. Everyone swooned. From my own experience, I suspect the culprit in the bake-time issue *might* be the almond flour. I had a lot of difficulty packing it into the measuring cup–no matter how many times I squished it, there always seemed to be room for more. So, I got out the scale, and I discovered that even a “packed” cup was under 100 grams, yikes! I’m sure that many of the folks who struggled with this recipe did everything right, including weighing ingredients… But it was a big wake-up call to me, and maybe this tip will help others, too? Cheers! Is it possible to double this recipe and bake it in a 9×13 pan? I really don’t think that would work; the dimensions of the pan wouldn’t allow for even baking. I did! I used a metal pan, not a glass one, and cooked it at 300F for about 65-70 minutes. It came out lovely; caramelized but not burnt on the bottom/edges, and juuuust cooked through in the center. Glad I did, too, because it’s such a flat cake and I have several people to feed it to; I’d rather have leftovers than not enough. I wanted a polenta/ricotta cake to go with a Mediterranean menu and of course went to you first — made this yesterday and it was a huge hit. I swapped the amount of cornmeal and almond flour, which made the outside nice and crunchy. And I peeled my oranges — I used Cara Caras, which gave the top a lovely pink color. Everyone loved that it wasn’t too sweet. Thanks again, Deb, for a winner! Do you mean that you peeled them and then sliced the thin slices for the bottom?Did that reduce bitterness? About to try this and I’m a novice baker:) Thanks in advance! I made this today as a rainy day stay-at-home project. While it tasted good, it certainly looked unimpressive and there are a few things I would change for next time. 2) Use finely ground cornmeal. I used a medium grind here and while it added a nice additional flavor to the cake, the texture was jarring. I might even omit the cornmeal and use all almond flour as Deb suggested. 3) The brown sugar slurry was more like a paste- had to use my fingers to spread it. I would add another 1-2 teaspoons of water to make it more spreadable. This recipe has also been featured on other blogs, and in one variation, white sugar was used. I think I will try this next time as the brown sugar became gloopy after baking and hid the vibrant colors of the oranges. 4) Weigh your ingredients! I packed in 1 cup of almond flour and weighed it, only to find it came out to ~95 grams. Big difference! I baked this over the weekend and already can’t wait to make it again! I was nervous after seeing so many comments from folks who had trouble, but the directions (including baking time of 40+5mins) worked perfectly for me. Some of the things I made sure to do based on the comments were: (1) butter the pan very well; (2) make sure to measure juice (I stuck with 1/3C even though the oranges yielded a bit more); (3) use store bought whole milk ricotta to really control liquid content; (4) REALLY pack the almond flour. The only adjustment I made was to add a tiny bit of extra water to the brown sugar slurry. I also opted not to use the jam glaze…the cake was beautiful without it, and I think it might have been a bit too sweet for me. Thanks for another great recipe, Deb. I made this in Denver, CO without any adjustments for altitude and it turned out great! It took 45 minutes to bake through, but it turned out delicious. My dinner party guests said it’s definitely a “make again” recipe. Next time, I may add slivered almonds to the topping, just because I love nuts! I am currently baking this. At 45 mins, it’s slurry, so we’ll see in another 10 mins. I was out of cornmeal, so I substituted cake flour. I hope it turns out ok, though. I just peaked in, and it’s already looking better after 8 more mins. The wait is killing me, but I imagine it will be like Christmas when I open my oven. Thank you, Deb for teaching me how to cook! My batter didn’t look anything like yours and it’s making me crazy! I used TJ almond meal and Red Mill course-ground cornmeal. Followed your directions exactly but mine was not as stiff as you describe and it’s much, much darker, more brown than yellow. I just took it out of the oven and it appears to have turned out fine (baking time was 40 min.) but it bothers me that the finished product doesn’t look like your photos….except for the height and oranges. Can you explain why the big difference? Thanks! I wonder if the oven temp at 300 is too low given how much extra time it took in my oven. The top of the cake did not start to approach a goldenen color until almost an hour. Given the almond flour and cornmeal I would remake this at 350 for the time specified in the recipe. Yummy! I just made this as a birthday cake for my mom. It looks a little moist, makes me wonder if it’s cooked all the way (toothpick came out clean and I left for 5 min more). I was shocked that the cake came out very easily and the orange slices look great – I didn’t have parchment paper, so buttered tin foil and it worked perfectly. My biggest concern is that it needs some sort of glaze. I will pick up some jam tomorrow as the recipe suggests to make it look better. It’s Friday and we’re eating it Sunday. I can’t wait to eat it! Also, I forgot to add that I did not have corn meal, but I used coconut flour instead (bc I had it and the texture is similar). Fingers crossed! Oooh must try this. I made a similar looking cake from Ottolenghi http://www.ottolenghi.co.uk/orange-polenta-cake-shop which was excellent but there was no ricotta. It did use orange blossom water which I love. Looking forward to making yours as soon as I can find blood oranges! But I thought it was a blood orange olive oil cake?? Where is the olive oil? 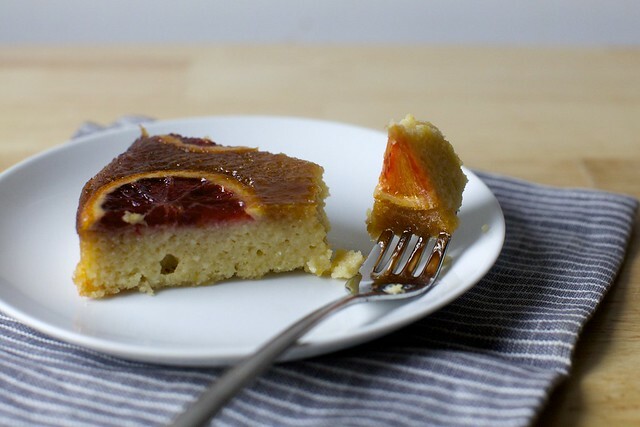 I think you were looking for this: https://smittenkitchen.com/2011/02/blood-orange-olive-oil-cake/ :) I made it last week without the compote and it turned out delicious! I believe you’re thinking of this cake. I made this tonight and it came out wonderfully. I love the nutty-ness of the almond flour and the heartiness of the corn flour — it was a nice balance with the citrus, and the dessert was a big success. I love desserts that are on the soft, dense, moist side so this was a perfect one for me. -I used ‘red navel’ oranges because that is what my farmers market had. They taste the same as regular navel oranges, but had a nice hue. -I used part-skim ricotta because my store was out of whole. It tastes perfectly fine with just that. -My bake time took closer to 50 minutes. The cake was very moist but not undercooked at this time. Toothpick came out clean, edges were golden brown. -I served with a dollop of ricotta, but later had some with plain greek yogurt which was lovely. Overall, a total (and beautiful) win — would make again! this cake was so fun to make. Left it bake longer as per Deb’s suggestion and it came out perfectly. It was beautiful and delicious. My gluten-free husband and non gluten-free friends were delighted. It is going in my ‘keeper’ file. I’m trying to plan my seder and need to do large portions of it ahead of time. Do you think this could be made Saturday for Monday night? How well does it keep? Keeps fantastically. I’d refrigerate it, just to keep those oranges fresh. Can have it out for an hour (or hours) before serving. Would love to make this for Passover! What can be subbed for cornmeal? Read Deb’s notes at the top of the recipe – she indicates that you can just use almond flour instead of cornmeal to make it kosher for Passover. That’s what I plan on doing – other commenters say it turned out well! 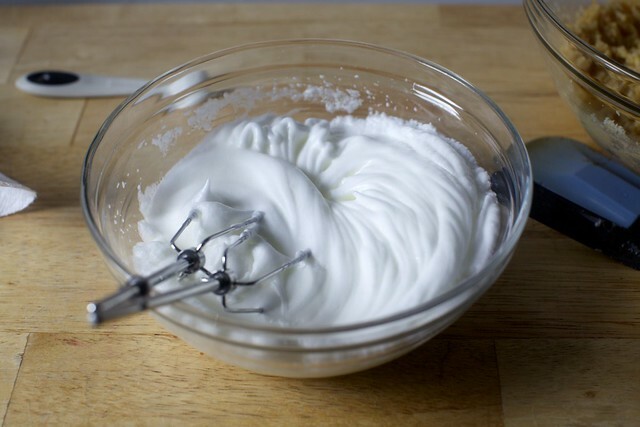 Should the egg whites be cold or at room temperature when they are whipped? I usually use them cold. I made this for Passover and it was perfect! Beautiful texture and not like the usual unleavened dessert fare. It was worth the frustration with the oranges (I was able to track down blood oranges and was so looking forward to a pretty top) – I had so much trouble slicing them thin enough. The brown sugar slurry was a little difficult to spread – it kept pulling back on the parchment paper and would gap and creep away from the edges. In the end, i think the slurry kind of covered the oranges a bit, and my small half-slices were easy to cover :( I baked it for an hour at 300, then 15 more minutes at 325. Next time I’ll take other commenters’ advice and bake at 325 for less time. It was perfectly baked through though, and didn’t collapse when unmolded (a small piece stuck to the parchment paper but I was able to fix it). Beautifully moist inside, thanks to the ricotta and juice. Got rave reviews! I made this for a birthday dinner I hosted; went very well! We are using your cookbook for my group’s “Cookbook Club” this weekend and I am re-creating this cake but using cherries instead as blood oranges are now out of season and I figured cherries + almonds go well together. Wow, thank you! Are those steamed buns in the picture? So cool. We’ll tag you in the photos from cookbook club this weekend. A lot of us signed up for multiple dishes because your recipes are so delicious and plentiful that we couldn’t stop at just one! Yum! You are spot on about this being one of the rare cakes that can beat a chocolate cake! I made two yesterday for my birthday party and this one was the winner despite being up against a dark chocolate mousse tart. Delicious and will definitely make it again! Deb, what almond flour did you use? I generally prefer Honeyville since it’s more finely ground, but if you used Bob’s Red Mill or the Trader Joe’s stuff I might try that since it’s easier to track down. anyway to adapt this for a passover dessert by using something other than cornmeal? it is pretty close except for this one ingredient. Please advise how many this feeds as I have 11 for dinner this Thursday? To make this dairy-free, could you substitute a nut cheese for the ricotta and EVOO for the butter? I second this! How could I make this dairy-free? Could I use a greased springform for this? Absolutely loved making this! Made a double batch – one in a loaf pan and one in a round 9.5 inch cake pan. Had to bake longer for the deeper loaf pan but still came out wonderful. I also subbed coconut sugar for the brown sugar and really loved the taste. I made this with two friends who came over for dinner and everyone agreed that it was fun and different and beautiful. One friend had never even seen a blood orange before and now she loves them! The cake turned out to be more like a dessert cornbread (with a moist consistency). We ate it straight from the oven so I imagine leaving it in the fridge to firm up would have made the consistency even better. This is soooo good!! I have a husband who would never touch it if I used the candied orange slices (but oh how I want them!) so, instead of doing this and inverting it, I just sprinkled some toasted almonds and extra sugar mixed with zest on top. Amazing…and gluten free! This is amazing and delicious. I used this idea of an ombré citrus cake base (http://thebarefoothousewife.com.au/upside-down-ombre-orange-cake/) with this moist, crumbly, buttery, yummy recipe. Made it tonight and served it to guests. Thanks! I love this idea! Stunning. Would this cake freeze well? Made this last night with the addition of 1/4 teaspoon of almond extract. I didn’t use fine ground cornmeal, so I see what some of the other commenters are talking about. Baked for 50 minutes total. The texture is super moist! I didn’t find it off putting. Overall, really good flavor and the moist crumb was great! I made this cake yesterday for a GF friend. The texture is very moist but quite nice. It was a bit grainy and dense with the cornmeal and almond flour and not sweet which is nice. I made it in two 6 inch pans for small cakes that are good for 2-4 people.The colour is nice too and dramatic with the blood oranges. I used kuquats around the oranges as the cakes were small. Any one added added a touch of Cointreau to this? And where? I made this cake for Passover and it turned out beautifully! I don’t have the world’s sharpest knife so wasn’t able to slice my orange “paper thin” but it was no big deal, they still candied. I also sprinkled sliced almonds between the orange slices and added some in the cake mixture itself. I baked my cake for 30 min at 300F, and then another 12 minutes at 325F and it was really dense, but not gloppy. Thanks Deb, and happy pesach! Count me in to the ‘delicious, but’ group. It tastes good. Did take longer to bake than Deb, but not by a lot. Caramel did leak, so the top was brown and sweet and a bit crunchy rather than really caremelised. I had extended the baking paper lining of the bottom slightly up the slides but this apparently didn’t do it. Next time I might try a non springform pan as it came out easily. I have a theory about the cooking times. Could the cake be wetter and appear underdone at the 35-40 minute mark if the egg whites turn liquid as they sit out on the counter until the final step? I overwhipped my first egg whites, so I started over and got it right, but then was dismayed when I grabbed the bowl to fold them in at last — I would guess almost half was liquid. Having spent ENOUGH time whipping egg whites for one night, I just went with it. The cake turned out amazing, but I definitely went 10-15 minutes longer in the oven. Next time (because with Deb’s cakes, there is always a next time, and it’s not long from now), I’m going to try whipping those egg whites with my immersion blender whisk, right before I fold them in, to see if that makes a difference. Thanks for another perfect citrus cake recipe, Deb! Could I divide this mixture into individual ramekins and if so how much would you reduce the baking time? Thanks! I made this in two 6 inch pans and a mini pie plate – about 3 inches across – and the baking time was just a bit less than stated. Is the ricotta full fat? Could one use part skim? Are you able to supply the nutritional values? Thanks and this looks wonderful. Thinking of peaches or apples using lemon zest. Just a thought. Made this twice now. First time blood orange, and it was a good way to use up the leftover ground almonds from holiday baking. And this time with navel oranges for Mother’s Day for my MiL, her request because we talked about it so much the first time we made it. It’s so good! I cut the orange slices into half circles, and fanned them around in a swirl so each slice will get an orange. I just made this and thanks to all the very helpful comments, I was very careful about the baking time. It came out perfectly at 45 minutes (toothpick came out clean at 40 minutes then 5 minutes more for good measure) at 300 degrees. My batter looked like Deb’s picture (thick) and I think it’s because I weighed the almond flour (which measured more than 1 cup firmly packed) and the cornmeal. My 2 blood oranges were small but juicy so I got 1/3 cup juice but instead of 7 slices got 5 slices. Seven blood orange slices would definitely have been more attractive but I also did not need to glaze the top because it was nicely glossy and caramelized. It came out of the pan with no problems. Lovely cake that goes well with afternoon tea. Ever tried this with stone fruit like peaches or apricots? My family won’t eat another strawberry summer cake (which is beautiful with gluten free flour and cornmeal subbed) and I’m looking for a new go-to summer dessert! I think it would be lovely here. This recipe is delicious! I made it this afternoon; it took about 2 hours from start to finish. The brown sugar and orange slices are amazing! Would a 9 inch springform pan work? I made this for my gluten free nephew yesterday. At 40 mins., it looked rather under-baked so I cranked the over to 350 for 10 more minutes. It worked. As a sugar addict, I prefer my cake a little sweeter. I would double the brown sugar “topping”. Otherwise, it had good orange flavor and the texture was much nicer than other GF cakes I’ve baked. If I use all almond flour, do I use the same amount for the substituted cornmeal? What does the cornmeal do for this recipe? And is there an acceptable substitute? Any ideas about a way to make this without eggs? 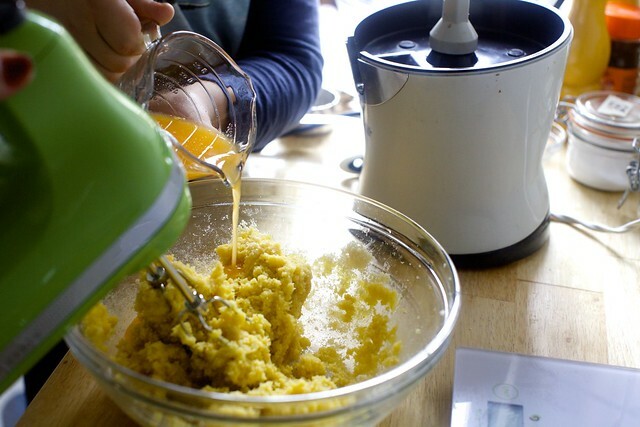 @Upsy – I make a polenta cake that is similar and have been successful using flax for eggs. I prefer it in that recipe because it adds a “nutty” flavor Of course for this recipe, you can’t separate and whip the egg white. I just made Smitten’s recipe today and will let you know how they compare. I like that Smitten has ricotta and I think it could handle an egg replacer. This is delicious! Really great citrus flavor. I used a springform pan which was almost disastrous but I put it on a baking sheet lined with a silpat mat for easy cleanup of the sugar that leaked out. It didn’t look very pretty when I flipped it out of the pan (a lot of broken edges..maybe due to the springform pan?). I made it with all almond flour, as I was nervous that my cornmeal wasn’t fine grind. I think I am going to give this another try in a few weeks if blood oranges are still around. Thanks! This was such a hit! I didn’t have almond flour so I ground my own almond meal, unfortunately my food processor has seen better days so the almonds weren’t ground very fine which made the cake rather mealy (if that’s the term I’m looking for). It did also take maybe an additional 30 minutes to bake but that could have been due to the course almond meal instead of flour I suppose. Topped it with a mascarpone cream for an amazing dessert! Thank you for such a beautiful recipe! This was so, so good! I made it all almond. Amazing! I made one with tangelos (the peels are too loose and they won’t slice into neat rounds, but otherwise delicious) and another with slices of kabocha squash on top and pumpkin pie spices in the mix. I love that it isn’t too sweet, so this is the sort of cake that works nicely for breakfast, especially with the heft from the almonds. For the first try I used unblanched ground almonds because that’s what I had, and it works ok but finely ground blanched almonds make a huge difference in texture. It was a big hit! Everyone had seconds. Served it with the remaining ricotta and Noth ng was left but crumbs. Thank you for sharing your details such as zesting directly into the sugar and before slicing as well as firmly packing the almond flour. I believe it made the difference! Don’t see how much zest to use on the ingredient list. Am I missing something? thanks!! I rarely make dessert recipes more than once or twice, but I’ve probably made this cake closer to ten times, because it is so delicious. I reduce the sugar in the cake to about 85g because of personal preference. I’ve used blood oranges, cara cara oranges, and regular oranges and it’s always turned out amazingly. I’d love to try it with grapefruits. I do always have to bake it at least fifty minutes. My mother, who hates candied oranges and anything slightly bitter, loved the cake, even with the candied orange slices. It’s a wonderful cake for very little effort. None here; it’s lifted by whipped egg whites. I was so glad to find this discussion about this cake! I made it from Elisabeth Prueitt’s Tartine All Day cookbook – and will put it in the fridge until serving tomorrow night. I am anxious b/c it seems so moist. I cooked in 9.5 in springform pan @325 for 45 min. Fingers crossed! I’ve made this recipe 4 times now, and every time it’s a massive hit! To get the paper thin strips of blood orange, I use a mandolin (before peeling, not after). This was absolutely decadent, yet not cloyingly sweet, nor too filling. Just beautiful, authentic flavors bursting on the palate! So amazingly good, that I can’t adequately describe it! Here, I’ll try—Slightly floral, citrusy and the moist cake had such a wonderful toothsome texture, not too moist—just right! My dinner guests all loved it! Thank you for sharing this exquisitely gorgeous dessert! This recipe looks amazing, but I’m allergic to eggs. Do you have any suggestions for how to make this egg free? I have loved EVERYTHING I have ever made of yours but this…. my mom actually made it and it just didn’t have great results. The taste was off. This was both a beautiful and delicious Passover cake. What a great use of my neighbor’s huge crop of blood oranges. I used a very fresh local ricotta which was slightly more moist and less dense than packaged but delicious. Definitely Served fairly cold (I made and refrigerated it the day before, took out of the refrigerator shortly before serving). It took just over 45 minutes in my oven. Definitely staying in my non-chocolate repertoire.